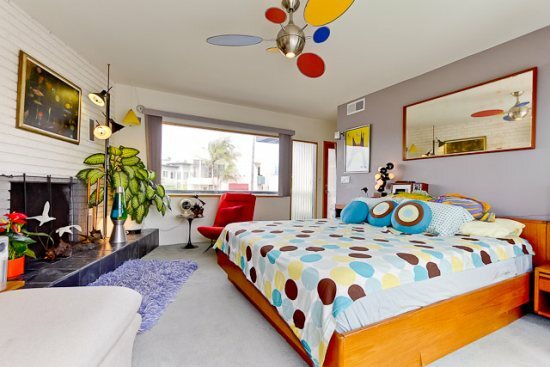 The Jetson and Orbit House is the combo of the upstairs Jetson House and downstairs Orbit House. 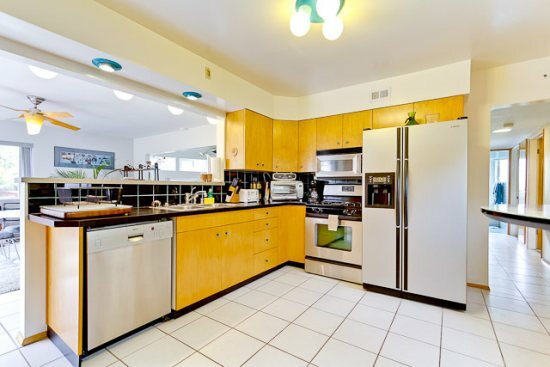 This is perfect for two families that want to be close to each other while still having their own private areas. THE JETSON HOUSE an upscale residence in North Pacific Beach, just one and half blocks from the ocean and Law St Palisades Park. 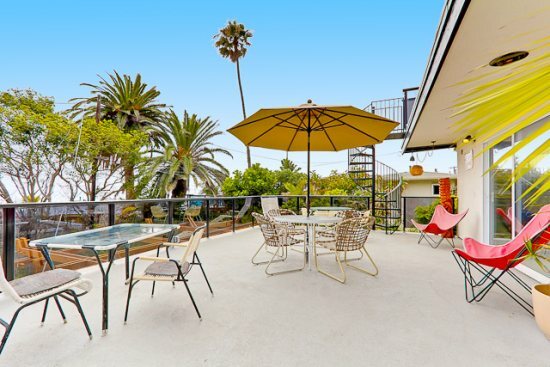 Sit on your spacious ocean view deck and watch the surfers and the sunset or climb the spiral staircase to the rooftop deck for an even more expansive view! Just steps away (2-3 minute walk), down to the beach and wiggle your toes in the sand. Walk along the surfline or go up to the boardwalk and go for a long walk or take our provided beach cruiser bicycles as this is at the beginning of the pacific/Mission Beach boardwalk which stretches for at least three miles along the oceanfront, all the way to the jetty. 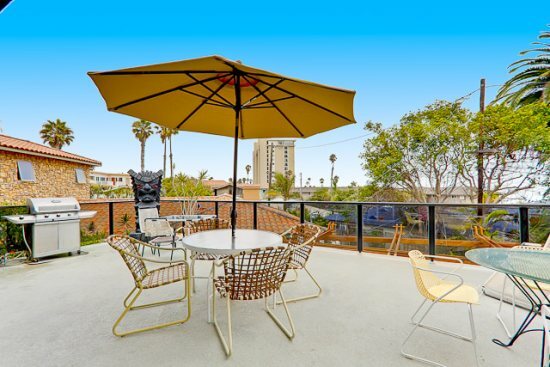 This spacious two bedroom/two bath home, the top unit of a duplex, is the place for gathering outdoors on the 2nd floor patio or 3rd level deck! 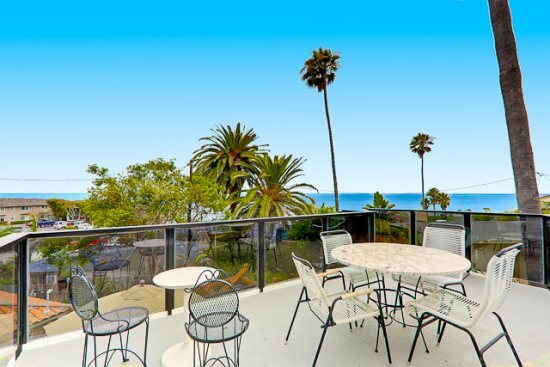 This unit has amazing ocean views,where you can actually hear the waves! 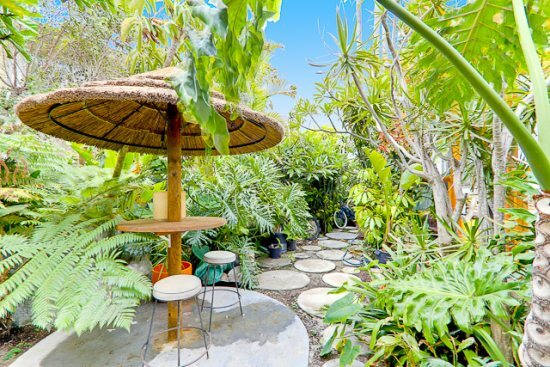 There is a BBQ, table and chairs for enjoying outdoor meals where you can feel the tropics of the garden. There is a king bed and a queen bed and a Queen Aero bed. Cable TV, WiFi, unlimited calling within the USA and Canada. Parking in the driveway. 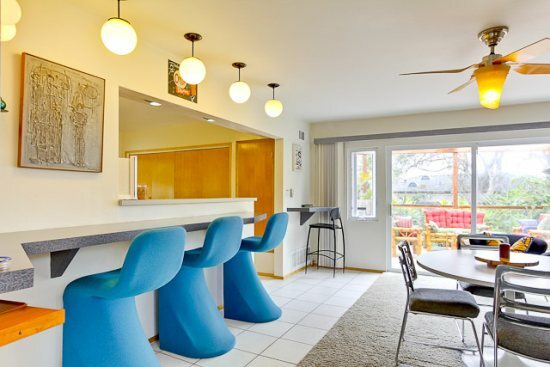 THE ORBIT HOUSE is a newly renovated and decorated Mid-Century Modern, 2 bedroom, 2 bath Tropical Garden View, lower-level duplex home in North Pacific Beach... just steps away (2-3 minute walk) from one of the most popular beaches in Southern California! 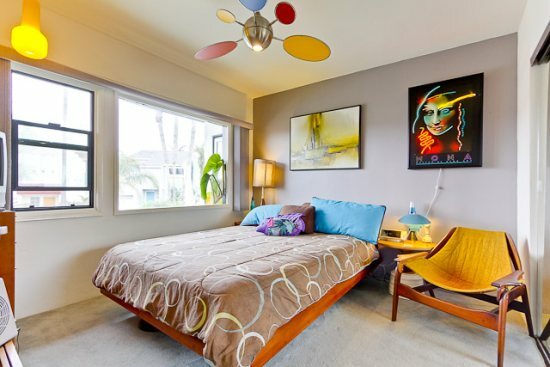 This getaway home is fully equipped and sleeps 8 with double Murphy Bed. From the moment you arrive you will experience a Blast From the Past! 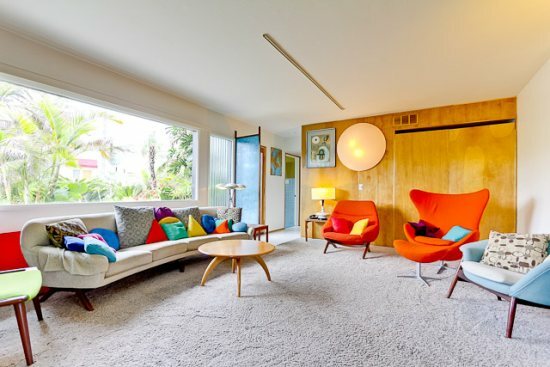 The vintage furnishings are fun and colorful in a Mid-Century Retro style! 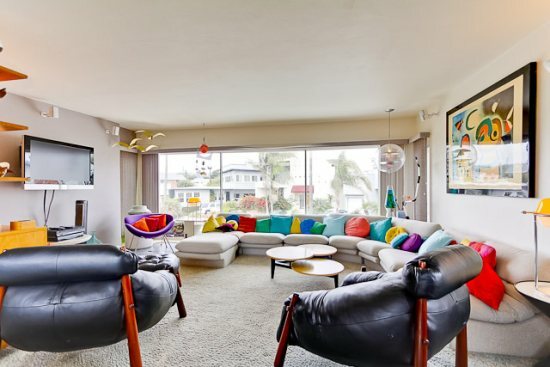 The Living room is furnished with a vintage sofa, original Ball Chair; vintage pottery and artglass... 54 High Definition TV/DVD/VCR and Bose Stereo Surround Sound. 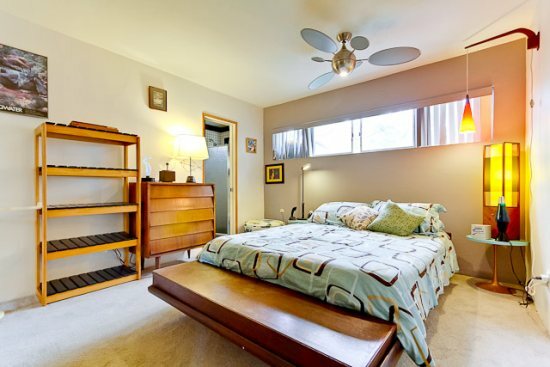 MASTER BEDROOM has a Queen mid-century teak platform bed, The GUEST BEDROOM is also furnished with a queen mid-century teak platform bed. 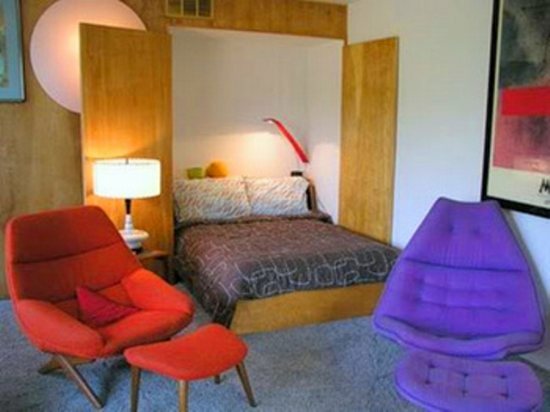 Full Murphy Bed in the Living Room and an Queen Aero bed. 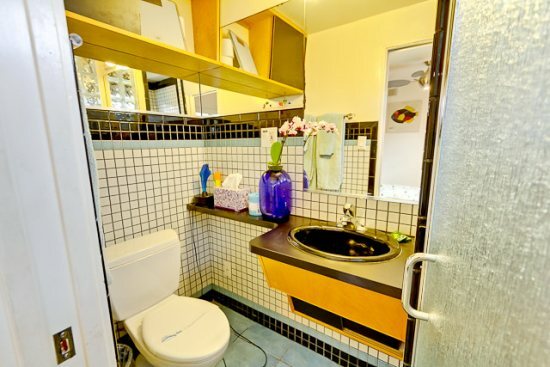 Bathrooms (all new)... Bathroom off master bedroom has shower and single bowl vanity. Full guest bath has a Jacuzzi tub/ shower combination. 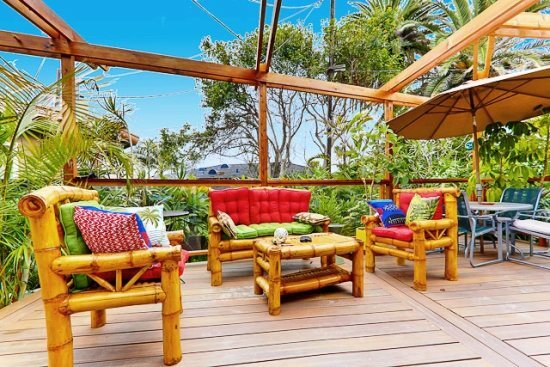 THERE IS A LARGE DECK Surrounded by Luscious Tropical Hawaiian landscaping which sets the tone... the quiet garden is beautifully planted with palms, plumeria, ginger, tea plants and other tropicals. There is also an outdoor shower. 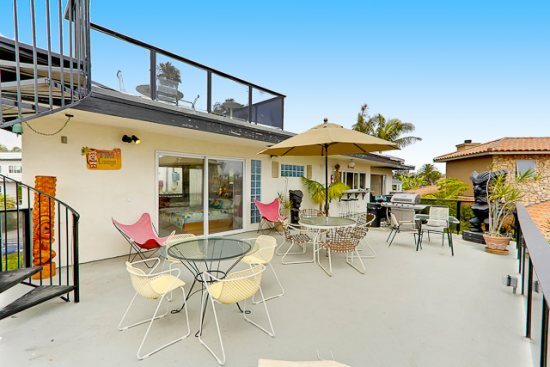 Get ready to kick-back.. the deck area is perfect for whatever activity you choose... whether dining, sunbathing, reading or just snoozing there's plenty of comfy furniture provided... patio table with umbrella (seats 4). A gas barbecue grill is provided. 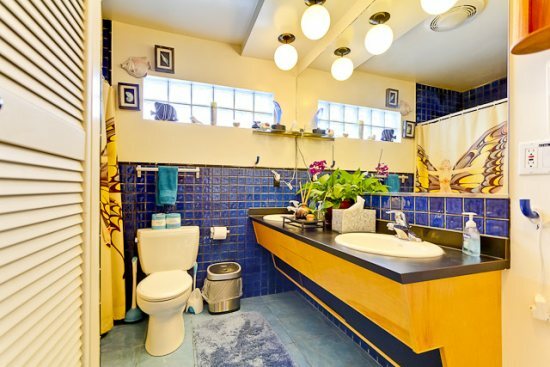 This home is just a short walk to a family friendly beach complete with a park, restrooms, showers,lifeguards and boardwalk for bicycling. We provide 2 beach bike cruisers (with locks), boogie boards, umbrellas, beach chairs and cooler.